Leave it to Ald. Bob Bauman to upstage Ald. Bob Donovan at his own press conference. Continuing his efforts to derail the Milwaukee Streetcar, Donovan held a press conference Tuesday at City Hall challenging Mayor Tom Barrett‘s position on the project. Donovan wants Barrett to promise a state subsidy for the project if he’s elected, or else put the entire project on hold. Donovan also continues to demand a referendum on the project, insisting that 70 percent of city residents oppose the project. Barrett and the rest of the Common Council have publicly ignored Donovan on this issue until yesterday. So Donovan called his press conference to dramatize his views, only to have Bauman unexpectedly join him at the podium. It was a strange twist to what was supposed to the be standard, one-sided press conference. 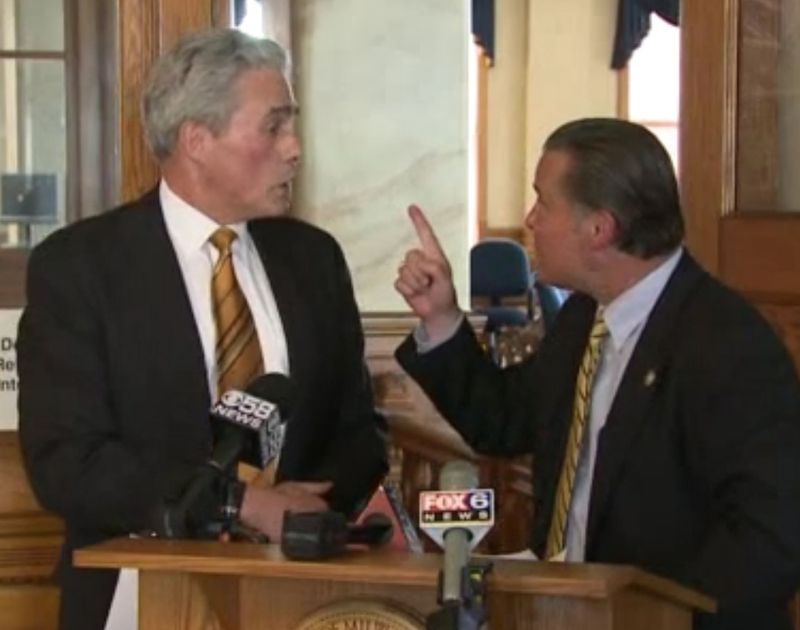 Instead, a largely one-sided shouting match occurred. Said Bauman to the other Bob: “I’m not going to let you lie to the public.” Bauman said Donovan was “showboating” and making “wild assertions” instead of “taking action,” noting that the federal money can’t be appropriated for another purpose and would be sent to another city if the Milwaukee project doesn’t move forward. Donovan wasn’t having it. He started repeating “shame on you” to his fellow Bob, after Bauman claimed Donovan was demonstrating an aversion to the City of Milwaukee. Then, after weathering a few sarcastic remarks about his hatred for the city, Donovan waved his hand and walked away. But the show wasn’t over, as the Bobs continued to trade barbs from across the room. While I don’t support Bauman’s hijacking of Donovan’s press conference (other than for the entertainment value), Bauman did manage to rather easily paint Donovan as a man of many words and little action when it comes to the streetcar. Why doesn’t Donovan introduce a file to the Common Council for a referendum on the project? Bauman noted that Donovan has proposed a referendum in the past, and his proposal was voted down. Bauman also noted that the money can’t be used for road repairs and that the federal government would send it elsewhere, to which Donovan didn’t have a clear solution. To score points with his base and talk radio, Bob Donovan appears perfectly content to grandstand on this issue. He has used the 70 percent opposition claim numerous times, but can’t seem to back up the figure. In November he claimed to have collected about 900 signatures in opposition, far short of the approximately 320,000 he would need (that would be 70 percent of those over 18 in Milwaukee) to prove his point. Donovan has claimed in the past he doesn’t have time to go around circulating a citywide petition against the streetcar. But more than likely, he’ll have time for press release after press release bashing the streetcar, until the rails are in the ground. UPDATE: I was unable to make the original press conference, and have relied on the raw video from Fox 6 to draw my conclusions. I have been informed that missing from the raw video is the the uninterrupted statement Donovan gave to begin the presentation, followed by a similarly uninterrupted one from Bauman. The back and forth between Bauman and Donovan began after both had been given the chance to speak. Why those original statements are not included in the raw video segment from Fox 6 is anyone’s guess. Actually, he’d really only need a number in the hundreds, most likely, assuming he was aiming for a statistically random sample with standard confidence levels, etc. Which is probably still giving him too much credit. Ald. Donovan did pose this to the Common Council. It was voted down ONLY when an alternative proposal was introduced. The alternative proposal stated that not one cent will be spent on the Milwaukee Streetcar until a complete cost report is prepared by the Comptroller’s office and presented to the Council. If the report comes back stating that the project will exceed $64 million, it is very likely that this item will go back to the Council floor to be rehashed. For Ald. Bauman to state that this has already been voted on and that’s the end is very misleading. The Comptroller’s office is waiting for a decision from the State regarding who is responsible for the cost of moving the utilities. If it is decided that the City of Milwaukee has to pay for this, the project will be presented to the Council as “fiscally unfeasible”. At that point, changes can be made to the plan in order to bring the cost back down to $64 million. Once the cost of moving the utilities is factored in, this will be an impossible task. If the decision from the State comes back in favoring the City over the utilities regarding the cost of moving the lines, the utilities will then publicly announce the total cost and state that they will recoup those costs from their customers – and not just the ones in the City of Milwaukee. 5 Council Members strongly support this project and 5 are opposed. Let’s see how the 5 in the middle vote once the Comptroller’s cost report comes back. As for reallocating the funds, Governor Thompson had no problem getting this done after the original project for this grant fizzled out. After working out an agreement with the Mayor and County Executive from our area at that time, he petitioned the change at the Federal level and got it. For those of you who don’t know, the streetcar proposal was NOT what this money was originally allocated for. And that is the concise version of the 600-1000 words you requested. Donovan seems incapable of drawing the connection between stories like the one linked below and the streetcar. The consultant’s recommendation is nothing new. We’ve heard time and again that Milwaukee has good bones, but is missing the ligaments necessary to make the whole body work. To put it simply: the streetcar is the connection that draws all of these spots together. Once it is laid, the downtown will quickly start to infill. @Patty When it was determined that Wisconsin was not going to use our HSR funds what happened? Our Wisconsin tax dollars (note Wisconsin pays out more than it takes in so those were WI dollars), went to IL, FL, CA, MI and so on. That is what will happen again. I understand there were some votes on the fence, but lets be clear the vote was 10-5 in favor. And 9 of those officials were re-elected (and Witkowiak’s loss didn’t have anything to do with that vote) . Seems like pretty solid support. Further, I’m pretty sure that is not exactly what the alternative proposal says, as the city is spending funds on the Streetcar project today (note: prelim engineering). Finally, yes suburban politics are once again attempting to meddle in Milwaukee. This time it is through the PSC. Very unfortunate. I’m suprised you would use Calif. as an example – it harms your point and proves mine. I don’t have an issue with expanding public transportation or taking steps towards modernizing our mass transit, I just feel that this program in particular is a very poor one. It’s a terrible route, and as a strong liberal I believe that any investment into mass transit should start by moving those in the low income neighborhoods to where the jobs are. And don’t tell me that this project will expand – these grants are being slashed, and by the time that stability and prosperity return to our Country, transportation grants will not be given for streetcars – not when you consider the current investments (public and private) in new fuel sources. The current polarization of our electorate adds to the problem. People are no longer focusing on the merits of an idea itself, but rather whether or not it fits in with what their political party believes. Young people are even more at fault, as they will side with ANYTHING seen as progressive or new. Critical thinking is becoming a thing of the past, and it’s being replaced by the categorization of every new idea. “Me? What do I think? It depends…what is the rest of my group saying?” How sad. No it doesn’t. The point is if Milwuakee doesn’t use the money for the streetcar it will not go to potholes, just like HSR monies (which went to a bunch of other states) it will head somewhere else such at Saint Louis, Salt Lake City, Portland, Seattle, Tempe, or even Chicago. Once again it is sad to see Wisconsin elected officials send Wisconsin tax dollars to other states. Right (note I said not exactly). And again as I said they are spending money today on the streetcar project, because preliminary engineering is underway. If we don’t have a good use for the money then maybe we should send it back. I have to side with Russ Fiengold’s ideology on this one – stop applying for grant money that you can’t use responsibly. If I won a ferrari but was told it came with conditions (I must pay the taxes on it, insure it and adhere to a very expensive maintenance schedule…and couldn’t sell it), I would have to reluctantly give it back. Of course I would try everything I could think of to change the conditions before I admitted defeat, but if I was only left with two options, my financial responsibility to my family would take presidence. Yes, we are residents of the City of Milwaukee, but we are also citizens of the United States and wasting tax money is NEVER a good idea. Maybe this current resession will cause a permanent shift in tax collection and spending. The Federal Government is not equipped to handle the oversight needed for all the grants they hands out. The majority of our taxes should be collected locally and spent locally so projects and social programs can have the proper oversite. Otherwise you end up with problems like mass daycare fraud…. and streetcars with insanely stupid routes. @Patty “and streetcars with insanely stupid routes.” First, I’ll simply disagree on this point. The route hits the highest job and population density in Milwaukee (if not Wisconsin) two vital criteria to the success of a line, and offers great long term economic development benefits. That said, can I assume if there was a route you liked you’d support it then? My son lives in an apartment behind Pizza Shuttle and works at a web design company, Core Creative, in the Third Ward. He doesn’t own a car because it is impractical for him right now. He takes the bus to and from work. He laughed at this route – he is the epitome of the socioeconomic group that this streetcar is supposed to appeal to, and yet the route is so short that it can’t even serve those on the east side who work in the Third Ward. And no, if the route were different, I would not support it. No matter where the route starts and ends, it is too short to serve a portion of the population big enough to justify it’s cost. I am also convinced (as I stated earlier) that by the time this Country can afford Federal transportation grants again they will be for projects of the future, not of the past. A very troubling issue. I’m 100% pro streetcar, but I’m very scared that this one will blow up in our faces unless it’s guaranteed that it can be properly built out. The “starter route” is practically useless and the issue of moving utility lines is a killer for the average clueless voter. If they could just get this thing all the way to UWM and better yet, the airport, then we’d have something. Also, Kohl’s bizarre decision to stay in the boondocks really hurts the potential. Patty, the most successful “new fuel sources” all generate electricity. You can complain about the route, but the fact is that streetcars are already powered by the fuel of the future; that’s not an issue. Nathanael, unlike buses and rubber wheeled streetcars, once the tracks are set – that’s it. The fact that the other modes aren’t locked into a route is a big plus. The tracks and the lines are not only limiting, but very intrusive, and they require having utility lines moved. If I were to put money on this, my bet is that this will be returned to the Council as “fiscally unfeasible”, and the Streetcar oversight committee will then modify the plan to one utilizing the rubber wheeled cars. They will have no other choice. “The fact that the other modes aren’t locked into a route is a big plus. ” Um no a fixed route is a benefit, an economic benefit. In recent history Portland (Pearl District 7 Southwater Fronter are ridiculous), Seattle, and Charlotte (the TOD here was very impressive to see) have proven this to be a big economic benefit. But this benefit can be seen in older cities as well. Yup, just like the Marquette Interchange rebuild (which incidentally the utilities wildly over estimated their costs in that project as well), and well countless public works projects in the past. And finally the idea that this project will switch to buses that look like streetcars well again isn’t possible legally and quite frankly wouldn’t have near the benefits of this project. What seems most likely is if the PSC goes the political route, we’ll see court, or Milwaukee will see the funds head out of town. And we’ll watch as Wisconsin tax dollars build something in Ohio, Arizona, or Illinois. Fixed lines are a benefit. First, the economic development that justifies the cost of this entire system is based on the physical commitment to service along a defined route. Second, the system has the potential to bolster the bus system by putting higher-capacity vehicles moving at greater frequency along main routes. The rubber-tire vehicles can then be used to feed the system. Third, fixed lines make sense because downtown isn’t going to move. Even with all the distruction caused by Hurricane Katrina, New Orleans has configured itself after the storm along the same lines that existed before. The proposed line runs through the center of the city, if there were some sort of event sufficient to shift the center of Milwaukee those changes would have to be so large that a $64 million streetcar would be a small concern. Based on your posts, I wonder if Alderman Donovan’s main criticism of the plan is that it doesn’t create a robust enough system? As you mentioned, your son laughed because the proposal is too modest. Would the alderman then be willing to support a larger system that will accomplish more of the goals laid out? Let’s still consider a relatively small with a system of two lines: one that runs from UWM to MU, and another that runs along the Fond du Lac corridor down to National Ave, each connecting through a small loop downtown. Such a system would connect the city’s most dense population centers, both poor and rich, to the concentrations of jobs downtown while allowing for plenty of new development infill. And might still come in with a construction cost of $250-$300 million. If that is actually his critique, would Alderman Donovan be willing to take a look at the city budget to find additional funds to expand proposed system above the amount permitted by the federal grant? The city has steadfastly focused on maintaining a stellar credit rating. Thus, the city has excess borrowing capacity, and this is the type of project that would justify taking on additional debt because it would grown the city’s tax base allowing those loans to be paid back. Further, this is the type of project that is ideally funded by a TIF district along the route because of the economic development occurs along a very narrow band around the developed route. Surely we wouldn’t have to rely solely on any one of the options, but the alderman could look at a combination of the above to fund such a system. It would solve the matter of the system being too small to work. Patty Doherty has raised the “flexibility” argument against the streetcar. But why stop at the streetcar? Expressways are even more inflexible and even more expensive. Travelers actually prefer predictable routing (aka “inflexibility”). Look at Amtrak’s ridership between Milwaukee and Chicago compared to Greyhound. People overwhelmingly choose Amtrak even though Greyhound is cheaper, runs about as often, and is “flexible”. Another failure of “flexibility” is Milwaukee’s downtown rubber-tire trolleys. After years of existence, they have never caught on, despite (or because of) continuous route changes. Unlike rubber-tire trolleys, modern streetcars have attracted both passengers and development everywhere they’ve been tried. There’s no argument more disingenuous than the one where folks try to equate the seasonal rubber tired “trolley” to the streetcar. What a shock that a bus with an ever-changing route, poor to no signage, unknown hours of operation, and uncertain availability doesn’t work well. A fixed rail tram is the exact opposite, and that’s why they’re typically successful when well-planned for. I just shake my head every time I think about this ridiculous squandering of years and money — what could have been had Milwaukee’s leadership not succumb to their own lack of vision and blithering suburban talk radio haters. How provincial we must look to any semi-sophisticated city. Time to get over finish line here. As the recent assessment of Milwaukee’s urban core revealed (to no surprise), this system will be critical to future growth. It’s one piece within a larger system that will attract and retain the bright minds that leave for this lifestyle elsewhere every single spring. I should have remembered the advice of Fr. Timothy O’Brien – if your original argument is strong enough, don’t stray – it weakens your point. It comes down to this – anyone with any economic sense who looked at the City as a whole would not recommend spending $10 million of our local tax dollars on a streetcar at this time. There are far more pressing problems facing this City. When companies scope out possible new locations for a manufacturing facility or a headquarters, etc., whether or not there is a short streetcar route in the area is not a big consideration. Taxes, crime rates and the number of educated and skilled workers are in the top 5 criteria when they review a possible location. The other things they look for are those specific to their individual needs, like a decent rail line or a shipping port nearby. Those who support the streetcar are either very young or they have a financial (or political) interest in seeing this project go through. The reason the average person becomes more conservative as they get older is because they have learned to be frugal – to appreciate the value of the money they have worked hard for. They have built up a great deal of practical knowledge through the years when it comes to managing their money and have learned from the financial mistakes they made in their youth. This streetcar is a poor financial move. $10 million could build a SEED school, or revitalize the 30th street corridor, or offer initial tax breaks to a new manufacturing business. The streetcar will do nothing but lock us in to a never-ending money pit. Saying that businesses will “infill” along this route is naive – there are hundreds (if not thousands) of additional factors that need to be looked at and evaluated. Economists are about as reliable as weathermen. When it comes right down to it, their recommendations are nothing more than educated guesses. So the argument goes, you are young therefore you don’t understand. Got it. You might call that category the creative class or Talent (Richard Florida look it up), and it is just these people that services such as the Streetcar demand. And if we hope to grow as a city, Milwaukee needs to attract and retain the creative class as our global economy shifts. See what you have done is presented a false choice. This $10 million is a TIF. The 30th St Industrial Corridor already has TIF for redevelopment. If it is even possible that you could use TIF dollars for a SEED school, maybe the Alderman’s office should work to find a location and operator, and propose a TIF for it, as the streetcar would not preculde anyone from doing so. Exactly what kind of tax break could the City of Milwaukee offer? I’m fairly certain that the City is extremely limited in its ability to offer tax breaks (beyond TIF). Further, the City of Milwaukee is no where near its limit of TIF use so it can today offer TIF dollars to headquarters or manufacturing firms regardless of the streetcar project. Once again we are being presenting a choice that isn’t real. “Saying that businesses will “infill” along this route is naive ” It is? Having seen Portland (Pearl District and South Waterfront), and Charlotte (TOD along the LRT) with my own eyes I’ll simply disagree. I am 61 years old, retired, and have no financial or political interest in this (or any other) transit project. I support transit because I realize that I will probably live longer than I can drive, and want to ensure that I can continue to be mobile even after I can no longer drive. @ Dave Reid – it’s interesting that you mention the improbability of tax breaks yet neglect to mention that the development that occurred on the streetcar line in Portland was only possible because of close to a billion dollars that was given to property developers in the form of subsidies along the existing streetcar line. You can’t compare two places using one to justify similar development in another and then ignore other pertinent factors. As for young people, I never said they “don’t understand”. They, as a group, contribute a great deal to our community. I know this first hand, as I was one and then I raised one. They are much more willing to work for change (and much more excepting of it). They are also one more generation removed from the sexist and racist views that seemed to prevail in older generations. In addition, they are much more concerned about environmental issues, as they should be. All I meant was that the younger generation tends to make financial mistakes due to a lack of experience with money and budgeting. Ask a few 30 somethings who took out cost of living loans in college if they’d do it again knowing what they know now. Also ask them if they over did it on their credit cards in their 20’s. In most cases, the older you get, the more responsible you become with your money. Personally, I just don’t see the logic in your argument. If you can show me evidence that at this time, in the economic state we are in, that this project is truly money well spent and that future grants are all but guaranteed, then maybe I’ll listen. @Patty There is no doubt that along the line in Portland various tax incentives and policy went along with the project, and I would fully expect that in Milwaukee as well (not pure tax abatement per se as we can’t really do that). But that simply does not mean the development didn’t happen (it did), that the streetcar’s location wasn’t vital to the development (it was), or that those developments would have occurred anyhow (not likely). As developer’s from Portland will tell you (I don’t believe you were at the city meetings where a major developer came in and spoke), the streetcar was part and parcel to their development efforts. Finally, breaks or not, Portland is adding over $3 Billion (yes with a B) to the tax base, from development within two blocks of the line, just awful. “You can’t compare two places using one to justify similar development in another and then ignore other pertinent factors.” No no, the City of Milwaukee has tools (TIF, RACM Bonding, MEDC loans, Brownfield Grants..), just simply not the type of tool you suggested we could use the $10 million on. Well not in so many words. I’ve pointed to multiple cities (and there is plenty of research and history out there and right here on Urban Milwaukee) that have seen the economic benefit in real increases to their taxbase, but you ignore it. That said, I have another question. So can I assume that when the economic state improves you’ll be all for it then? Looks like we lost grant application number 4….and still no comment from the Mayor. Very few of the winners were for streetcar expansions. Winners on page two. I’m sure this is another even-handed analysis put forward by Patty, ha. Jesse – all I did was Google Portland streetcar and look at all different articles about the topic. I think I’m a pretty fair and open-minded person, and I thought comment sections were meant for spirited debate – a chance to express your views and read and consider the arguments of those who see the issue differently. If you would rather be nasty and put me down for having a different view, that’s up to you, but that is not how I treat people. Below is the main portion of the article. I hope those who enjoy looking at and discussing a topic from all sides will read it and comment on why they agree or disagree. I wouldn’t exactly describe the article as radical. “Did the Portland Streetcar Generate $2.3 Billion in Development? According to the city of Portland, the city’s streetcar line generated nearly $2.3 billion worth of development. They calculated this using a very simple methodology: they simply added up all the development that had taken place within three blocks of the streetcar line since the line had opened and attributed it to the streetcar. As Tom Rubin says, that is like giving a rooster the credit when the sun comes up. All new construction at Portland State University ($142.2 million), including a $7.5 million garage with nearly 1,200 parking spaces (349 new, 810 renovated). The new Whole Foods grocery store — which is built on top of a large parking garage. Station Place, an $18 million apartment building — and the $8.8 million parking garage that goes along with it. The $11 million renovation of the First Presbyterian Church — and the 170-space underground parking garage that goes with it. Benson Tower, including 150 parking spaces. The Crane Building, which converted its basement to 46 parking spaces. The Cronin Block, a $50 million townhome project with 335 parking spaces. Edge, a $27 million mixed-use project with three parking lots, one underground. Most of this stuff would happened without the streetcar (does anyone think the University would have faded away were it not for the streetcar?). Some of it is double counted: Portland sometimes credits OHSU’s $103.5 million South Waterfront office building (with 650 underground parking spaces) to the streetcar, and sometimes to the aerial tramsway. Hardly any of it is “transit oriented”: most of these developments have plenty of parking. @Patty As I explained before there is no doubt that various incentives were involved as well, for the most part that is how development works period. But again that doesn’t mean the streetcar didn’t play a significant role in the development. For you can see that property values are higher near to the line, which means demand is higher along the line (this is just a clue). But back on the subsidy thing, the two areas in question (which I gather you have never seen because the areas are very very pedestrian oriented), were brownfields so of course there was assistance. You can add up the subsidy and the streetcar costs and you still have to pull the trigger. The addition to the taxbase, population growth, density, retail activity is simply too much to say no to. Just a side note, most development is subsidized, even (especially) the single family home. “Most of this stuff would happened without the streetcar (does anyone think the University would have faded away were it not for the streetcar? ).” Really? Huh I specifically remember the developer from Portland saying that is essentially not true (and I’m not talking about the university stuff, he did around 15 development projects). “Hardly any of it is “transit oriented”: most of these developments have plenty of parking.” Too funny. Having walked and ridden the line I can you tell you the building designs are very transit and pedestrian oriented. Also so you know Patty, often the bank will require developers to over build parking (old school thinking that needs changing) and some gov policies still force parking minimums as well (maybe your boss can work on getting rid of that one?). Further, what’s interesting about the info cited above, is it doesn’t include the number of apartments/condos or office square footage. Then we could actually do some comparison to determine how car-oriented it is, or isn’t, but again the designs of the buildings are all about pedestrians and transit in the Pearl District. “More than half of all new development over the past decade in Downtown Portland has occurred within one block of the Portland Streetcar, an area which previously accounted for less than 20% of total development. [iv] ” That dramatic shift in where development is happening is a clear sign regarding the value to development in regards to being located on the line. “Development along the streetcar line have also been denser than those not on the line: development within one block of the Portland Streetcar has utilized nearly 90% of its allowable floor area-ratio (FAR), compared with an average of under 30% pre-streetcar and 40% for non-streetcar-oriented development in Downtown Portland. [v]” Yup very transit and pedestrian oriented, and apparently a fact the anti-planner missed. Not to mention very good for the long run taxbase. [iv] Streetcar-Development Linkage: The Portland Streetcar Loop. E.D. Hovee & Associates, 2008. [v] Streetcar-Development Linkage: The Portland Streetcar Loop. E.D. Hovee & Associates, 2008. Wake up, libertarians and conservatives! When are you going to admit that the car isn’t the best and only mode of travel for all of us? You sit there and whine about how empty the downtown is, and how it isn’t hospitable to the elderly or children, or the twenty somethings who are smart enough to invest their meager earnings into something besides a used car. But then you oppose a mode of transit that would allow all of these groups access to and from a once-great city. You also pretend that thousands of Chicagoan tourists LIKE driving four hours roundtrip to our festivals and waiting in endless lines for parking (where one can find it), as if tourism is some inconsequential part of our economy. No streetcar or rail project was ever realized all at once. If we expected the New York subway or London Tube to be built all at once, they wouldn’t exist. You have to start somewhere. And to do that you have to be able to look at the long term. 57 of the largest 61 cities in America now have light rail, a metro, a BRT system, a tram, a streetcar, or a monorail. Do you really believe Milwaukee is better off in the Tulsa-Oklahoma City-Tampa League? Or in the same league as Denver, Miami, Minneapolis, San Francisco, Seattle, Kansas City, Pittsburgh, etc? Either support progress or get out of the way. We are tired of your fossilized excuses to not invest in your kids future. For all you people that want this street car, Pay for it out of YOUR pockets, not out of mine. You talk about federal money, the government is in such a hole they have a problem running this country from one year to the next, so lets all jump in and dig that pit a little deeper. And just where do people think that federal money come from. HELLO, try your own pockets. And you are the same people that will scream bloody murder when taxes are raised. And I guess your answer to that is, at least we will get some of it back. When you cut through all the B.S. You are going to pay for this thing a long time after that federal money is in some bodies pocket. Good example, county stadium. The tax that was supposed to end after it was paid for, OOOOOOOOOOOOOOOOOPPPPPPPPSSSS, now a maintenance tax that will never end. And by the way, if you go to game, bring your rain gear, more money well spent. You want transportation in those areas. Get your butts on a bus, we already have plenty of those that we are paying for. And if you believe for one minute that WE Energies is going to eat the cost of this joke, keep on dreaming, the cost is going right back to the people in this city, and you will be paying forever on this stupid pipe dream. You forgot “Choo Choo” whistlestop Meyer.